Meatballs are a wonderful dish to have in your cooking repertoire. You can use them for many different dishes, and they’re wonderful for a crowd. If you want a great recipe to make classic Italian meatballs from scratch, you’re in luck! We’ve put together a recipe for homemade meatballs and tomato sauce. Whether you’re looking for a great dish to bring to a potluck or need something to meal prep. Whatever the occasion, everyone is sure to love this recipe. The fresh herbs, tender beef, and fragrant garlic and onion all come together to make a comforting, familiar taste. Plus, simmering the meatballs in the tomato sauce for a while really lets those flavors come together perfectly. To learn how to make classic Italian meatballs, follow our simple recipe below! Make the sauce. In a large pot, heat the olive oil over medium heat. Add the chopped onion and minced garlic and saute until tender and fragrant. Add the crushed tomatoes, salt, dried basil, parsley flakes, and black pepper. Allow the sauce to simmer for 30 minutes. Make the meatballs. In a large bowl, add all of the ingredients for the meatballs. Using your hands, mix the ingredients until they are evenly combined. Line a large lipped baking sheet with aluminum foil and spray with cooking spray. 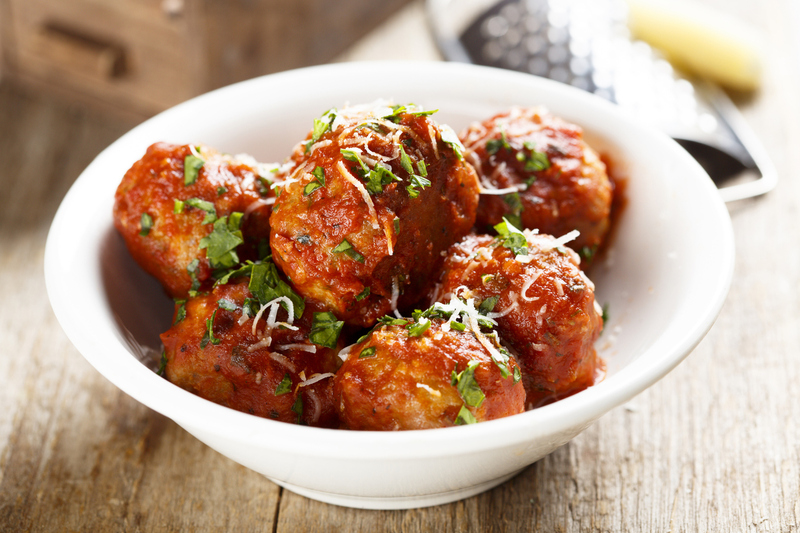 Form your meatballs. Roll them into balls about 2 inches, weighing about 3 oz. Place the meatballs evenly apart on the baking dish. Bake the meatballs for about 10 minutes or until browned on the outside. Take the meatballs out of the oven, turn them over, and bake them for an additional two to three minutes. After taking the meatballs out of the oven the second time, add them to the tomato sauce. Simmer the meatballs and tomato sauce over low heat for 1 1/2 hours. Stir every 20 minutes or so. After the sauce and meatballs are done simmering, serve over spaghetti, as meatball subs or just by themselves. To store, remove the meatballs from the sauce and refrigerate or freeze in separate containers. When you’re preparing to make these meatballs from scratch following our recipe, make sure to use the best ingredients. Using Sauder’s eggs, you know that you’re putting a great component into this dish. To find our top-quality eggs at the nearest shop, please use our store locator today!